A man walks past a screen showing preliminary results of Russian President Vladimir Putin in the presidential election, at the headquarters of Russia's Central Election Commission in Moscow, March 19, 2018. The Organization for Security and Cooperation in Europe says Russia's presidential election was conducted in an orderly fashion but lacked real choice. "After intense efforts to promote turnout, citizens voted in significant numbers, yet restrictions on the fundamental freedoms, as well as on candidate registration, have limited the space for political engagement and resulted in a lack of genuine competition," OSCE election observers said in a statement. 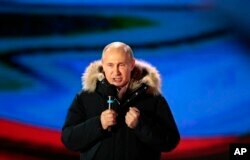 President Vladimir Putin is headed for a resounding victory in the election, soundly defeating seven other candidates. 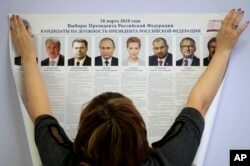 FILE - A polling station employee hangs a list of candidates for the 2018 Russian presidential election during preparations for the election at a polling station in St.Petersburg, Russia, March 16, 2018. "While candidates could generally campaign freely, the extensive coverage in most media of the incumbent as president resulted in an uneven playing field," the OSCE observers said. "Choice without real competition, as we have seen here, is not real choice." Russian President Vladimir Putin speaks during a rally near the Kremlin in Moscow, Sunday, March 18, 2018. Putin's closest rival in the election was opposition leader Alexei Navalny, who was disqualified from running in the election when he was convicted for embezzlement in December. Given a five-year suspended sentence, Navalny said the conviction was politically motivated, to keep him out of the race. 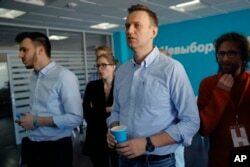 Russian opposition leader Alexei Navalny observes the election progress at his Foundation for Fighting Corruption office, in Russia, Sunday, March 18, 2018. Navalny led a boycott effort, while Russian election organizers hoped for a high voter turnout to legitimize an election long seen to have been a foregone conclusion. Putin has been in power as either president or prime minister since 1999.